#1.1 How to Pick the Perfect Bullet Puller for Reloading? #1.4.1 Why use a bullet puller? #1.4.2 What type of bullet puller should you choose? #1.4.3 How to use a bullet puller? #1.4.4 What type of bullet puller is best for reloading? The creating of your own ammunition is an art, but any artist will tell you that you are only going to be as successful as your tools, that is why having such things as dies, a press, scale, and the like are extremely important if you were going to be able to create your own ammunition. It is also important that you have the best bullet puller. This is one of your most important tools for many reasons. First of all, you may make a mistake when creating a batch of ammunition which requires you to be able to take that ammunition apart safely. You also want to be able to break apart old ammunition so that you can reuse those cartridges for new ones. How to Pick the Perfect Bullet Puller for Reloading? There are two different types of bullet pullers: inertia and cam-lock. The inertia type, which is also referred to as a kinetic puller, is shaped very much like a hammer. This kind of puller relies on the friction created when the bullet is created and by using that force you are able to pull the bullet out of the cartridge. It should be noted that it can take several swings before you are able to unseat the bullet, making it so that it is not ideal for everyone. The cam-lock puller mounds within a reloading press and pulls out the bullet by operating the presses arm. This requires much less physical effort and is ideal for those who have large batches of ammunition to break apart or who have physical disabilities. This isn’t a factor you often read about in reviews, but it is something that you need to consider. If you are a person who will put off your cartridge reloading until you have a large batch, maybe even eight or nine dozen, then you may want to look at the cam-lock option. This is not necessarily a quicker option, but it is one that requires less physical exertion which will save you time in the long run. A tired person will have trouble continually going. If you are using the cam-lock option, then you are going to need a press that works with that particular bullet puller. This may mean that you have to buy additional equipment, which may not work for you. The tools you have may limit your choice. The kind of material that the puller is made of is extremely important. Consider that this is a device that requires a great deal of physical strength from the device itself to be able to work. There is a lot of labor involved for the puller, so you one something that is going to last for quite a while. This is especially important for those who opt for the inertia puller. If you were going to be unloading several hundred rounds at a time, you should be aware that this grip is going to be painful in your hand after some time. Maybe even after just 50 strikes. This is why you want to choose something that is comfortable and easy for you to hold. With this in mind, it is now time to start addressing what I found to be the top bullet pullers on the market. This list is not only based upon my own personal testing of the products, but reviews are read as well. I wanted to make sure that I thoroughly tested out each product to see how good it was, so you could have confidence in my thoughts on the products. Before moving on in this review, it is important to tell you a little bit about me first. I understand that anyone reading a review has a reason to be skeptical. You don’t know who that person is, what their qualifications are to make such a review, and if they are being paid to support one product over others. Those are all legitimate concerns. First off, I have been writing reviews related to reloading products because I have been an avid gun enthusiast for years now. It has been at least 40 years since I first picked up a gun, and I have been a hunter, competitor, and marksman ever since. Years of handling guns and firearms has made me sort of an expert. I have used a large assortment of products related to weapons, including creating my own ammunition, and am frequently asked by people my thoughts on certain products or techniques. 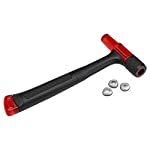 This is why I thought it would be good to spend a little time writing reviews on products, including the bullet puller. No one paid me for these. I am doing this solely to provide information I know. I will say that I did test and learn about every product I am supporting in this review. All of them I own myself or have friends that do, so I was able to test every product quite extensively before providing this review. In addition, I tested several others that I did not include in this review as I found them to be not of the same quality. This puller is specifically designed so that it is easy to pull jacketed bullets from the cases without causing any damage to either entity. This puller uses the standard 7/8 inch -14 threads, making it so that it feels like you have a single stage reloading press. All you need in addition to the puller is to get yourself the die set up in the press with the caliber you intend to use, place the cartridge that contains the bullet you are looking to remove inside the press, lift up the handle, tighten your collet, pull down the handle and the bullet is pulled out easily. RCBS Bullet puller Product Review. No more hammering like you would normally have to do with inertia bullet pullers. You can break down ammunition much easier with this bullet puller. Best of all, you can purchase additional caliber collets to use within the device so you are not limited to what is provided within the kit itself. Be aware though that you are not able to use non-jacketed bullets or lead bullets with this puller. This is a product that is made with the highest quality materials, and is perfect for those who are looking for a puller that is quick and easy to use. You will love that its design ensures that you did not damage either the cartridge or ammunition, making it easy to reload should you have created a bad set of rounds. 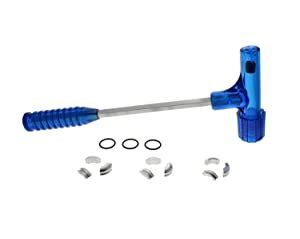 This is another great puller that makes it easy for you to be able to disassemble the parts of a bullet safely and easily. While many companies were building the traditional cam-lock bullet puller, Hornady decided to create a different look and design. This was one of the first pullers to be specifically designed so that it can be mounted directly on your reloading press. This makes it extremely easy for you to be able to pull out your ammo much faster, especially if you have created a batch that is faulty in some way. 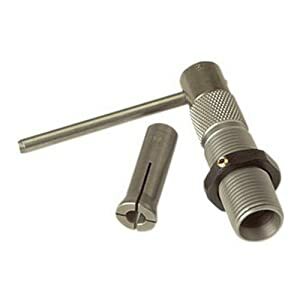 It only takes a matter of a few seconds for you to pull out the bullet from the cartridge and this puller is designed to ensure that the round does not break inside the cartridge. It is one of the safest on the market today, allowing you to unload as many as 20 cartridges in a minute. The great part about this particular puller is that it uses the strength of your press to remove the ammo. There is very little need for your own physical strength in this operation, ensuring that you aren’t exhausted or sore after unloading rounds. Plus, it is easy to store and build with great durability. A true winner for sure. For those who are looking for a no-frills option, this is a great place to start. For many, the reality to them is that one will it puller is really no different than another, especially when talking about the inertia option. This is for those who want a sturdy design that simply doesn’t cost a lot of money. This puller is extremely easy to use, acting is really nothing more than a hammer that easily allows you to be able to dislodge and pull out the bullet easily and quickly. Some are little skittish about using this type puller, but he will have no concerns after trying this a few times. 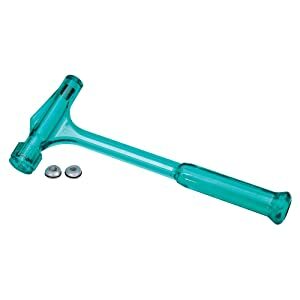 This puller allows you to easily release the bullet and powder so it should come right out by using the hammer. It usually takes no more than a couple of whacks to get it to knock out the bullet. It can be used on virtually any type of bullets, anything from .45 to .70 and everywhere in between. There are three different collets that come with it, making the unloading process even easier. Plus, this is a puller that is built the last. No doubt it work well for you each and every time. You could go out and spend a lot of money on a fancier option, but why do so when you can get everything you need with this durable inertia type puller? 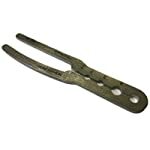 This is another great inertia bullet puller that comes at a low cost and is ideal for those who like the traditional way of removing ammo. What I liked about it more than other types of initial pullers is the way that the handle was designed. It looks very much like he would finding your standard screwdriver, which are built for comfort. I liked that a lot. This is a perfect choice for smaller caliber rounds but will work with larger rounds as well. You can easily pull out rounds with calibers from 5.7 x 28FN two even larger sizes. It’s made of a durable plastic and aluminum combination, and the handle is ergonomically designed, ensuring that you get a great grip while also making it comfortable. The design is made to protect the bullet and the case, so you will not damage either. This make sure that you are able to separate the components without damaging your equipment. This is the perfect bullet puller for a person who uses a multiple assortment of calibers, as it works easily with any kind of round. You simply can’t argue with great its craftsmanship and design. This is another simple kinetic bullet puller. This is a great option, coming at a low price but yet still build with incredible quality. What really amazed me about it was what a beating this little plastic product could take. I have used this on a number of occasions and of amazed at the continual use that it provides. It truly is durable. It can handle virtually any kind of cartridge. As I have used it anywhere from 500 Smith and Wesson all the way to such rounds as .223. It has a nice little grip to it that makes it easy to hold use but gives just the right kind of give so that your hands don’t become sore during 20 or 30 minutes of use. I have been extremely impressed by the fact that I have been able to take apart every cartridge after just three whacks, but I have yet to see any cracking or damage to the bullet puller at all. It’s pretty amazing how durable this little hammer is. It also comes with an open Which makes it easier for you to secure the next cartridge into the collet. This saves a little bit of time, but does cause an issue with powder sometimes coming out of the open. You have to be a little more diligent to pay attention so that you don’t have waste occur. This is a great kinetic pull Kit, which is built providing you with an ergonomic handle, which not only makes it more comfortable to use, but makes you fixing your mistakes a lot quicker and more efficient. The holding chocks come with three different cases which can accommodate 5.7 and .22 as well as other cartridges associated with these families. It is made of the highest quality materials, and is made to last. 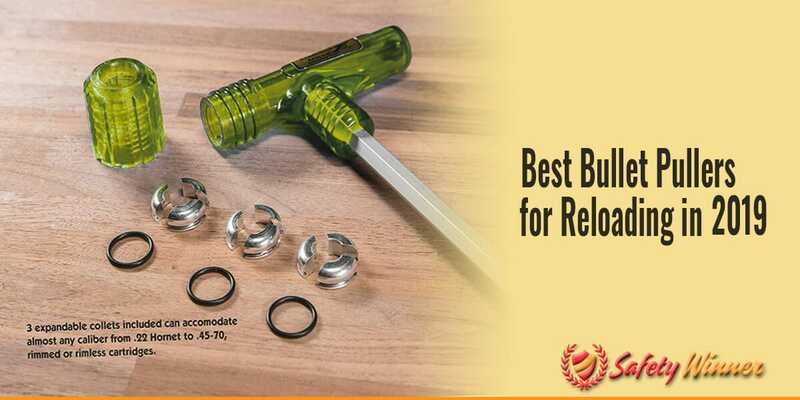 RCBS has established themselves as one of the best brand names in terms of creating quality reloading products, and this lives up to their standards. I like that the hammer head allowed you to see through which made visual inspection of the cartridges during the process quick and easy. The long handle gives you a lot more momentum when you are performing the task, and relieves some of the strain on your wrists and hands. I also loved that this was built as one piece, making it so that it was actually a lot more durable. Three different sized shell holders are included and I noticed very little distortion of the product even after hundred and 50 strikes. Truly a tough little bugger that you will find an ideal choice for yourself. This bullet puller comes with three expandable collets. This makes it easy for you to be able to remove and disassemble cartridges anywhere from .17 to 50 caliber. Bill to ensure that you can fully reuse brass, powder, and projectiles. In fact, I love the fact that I could use this for virtually any caliber round, anywhere from the 22 hornet all the way up to 45-70. It’s perfect for rimmed and rimless bullet cartridges. It comes with a detailed set of instructions, showing you diagrams and providing step-by-step procedures to show you exactly what you need to do. The collet captures are both expandable and recessed, which makes gripping of the cartridges and holding them in place a lot easier. 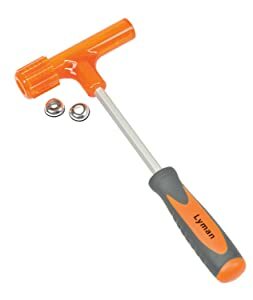 One good whack with this hammer and you can be sure that your cartridge is going to come loose. The puller is constructed with a durable polycarbonate compound built to handle the impact, and has a metal shaft that will help to make it last longer and stay stronger. This is a heavy duty rubber, that can handle the job and you’ll be impressed at how tough it is each time you use it. The handle is built of a textured, molded rubber, which ensures that you go to secure grip. It is also created to ensure that the fatigue on your hand is lessened. I added a brief description about this in the last section, but I want to get a little more detail about the different types of bullet pullers so you can feel comfortable about your choice. As I mentioned, there are two different kinds of bullet pullers – inertia and cam-lock – but some may feel quite uncomfortable with the idea of using a hammer looking device to break apart ammunition. So, a little more explanation is necessary. Inertia Bullet Puller. The inertia puller is using weight to be able to remove the ammo from the case. The cartridge is held in place in the back of the puller, referred to as the, and you use your momentum to swing the puller at a hard surface, like concrete, to dislodge the ammo from the cartridge. Most people hear this kind of description related to ammunition and think that there is absolutely no way they could use this without it blowing up in their face or causing serious injury. The truth is that this is an extremely safe means of dislodging ammunition, and is the most common form that people use, because of how easy it is. Even if you are a beginner, you will find that this is an easy option to use. It is safe and effective, however, you should be aware that it takes a little practice. For a beginner, you may have to whack the cartridge 10 or 20 times to properly dislodge it, slowing you down and adding time it takes to unload your cartridges. Cam-lock Bullet Puller. The cam-lock, also referred to as the collet bullet puller, will require the use of a reloading press for you to be successful. Where the inertia puller uses your momentum and strength to remove the bullet, this option actually grabs the bullet and pulls it free by using the handle of the press. This requires a lot less physical exertion on your part, but it is also more time-consuming, at least for those who are quite efficient with the kinetic option. It takes time to load the cartridge into the press, maybe a few more seconds, but it is still time. However, it means that you will be a lot less tired if you are doing a large number of rounds. It is simply a matter of time vs. energy. Plus, you will need a press to be able to use this puller. There are a lot of people who come to me and asked me questions about these bullet pullers. I guess I have become kind of an expert to them, so here are some of the more frequent once I receive. Hopefully this will answer some questions for you. #1 Why Use a Bullet Puller? The purpose of the bullet puller is easy. You will either have situations where you need to break apart your cartridges because you have reloaded them improperly or you simply need to break apart a used cartridge. 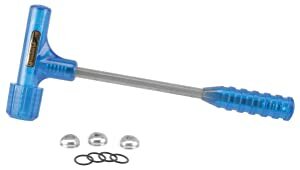 The bullet puller becomes a necessary tool for any person who is reloading their ammunition. Without one, you will be simply wasting a lot of powder, ammo, and brass. #2 What Type of Bullet Puller Should You Choose? I explain to you the two different types of pullers, so this really becomes an issue of what you feel comfortable with. For generations people have been using the inertia option because it works incredibly well. Simple doesn’t necessarily mean inefficient, and this is a great option. However, if you are looking for a bullet puller that requires less exertion on your part and you want one that is efficient with every use, then you may want to look at the cam-lock option. It does require you to have a press, but this is a way that you can save yourself some energy and easily get out your ammo without much stress and strain. #3 How to Use a Bullet Puller? The advice that I give to most people, especially those who decide to go with the kinetic puller is that they are better off choosing one that comes with a list of instructions. This is an easy option to use, but having a good set of instructions will really be helpful. It makes sense to find one that explains exactly how to use the puller so you will not have any issues in trying to use the product. #4 What Type of Bullet Puller is Best for Reloading? Being completely honest, I have always loved the inertia options. They work well, they are inexpensive, and they are easy to use. They do require strength and a lot of energy to continue to use them, especially if you are going to do a large batch of rounds, but I find that this became an option that worked out best for me because I rarely actually had to use the product. Once you get good at creating ammunition, you rarely need a product like this, making it beneficial to save yourself some money. This review has hopefully help you to make a wise decision about what kind of puller works for you. The truth is that there are great options out there, and it is really about what works best for you. Just be safe and take care of your equipment, and you will be happy with which ever purchase you made.